Coldwater Machine Company, a leading engineering solutions company that manufactures and integrates assembly automation and special machines, has announced another of its automated laser welding lines for powertrain components. Based on standard Coldwater Machine developed laser welding modules, each system is customized to suit customer requirements. 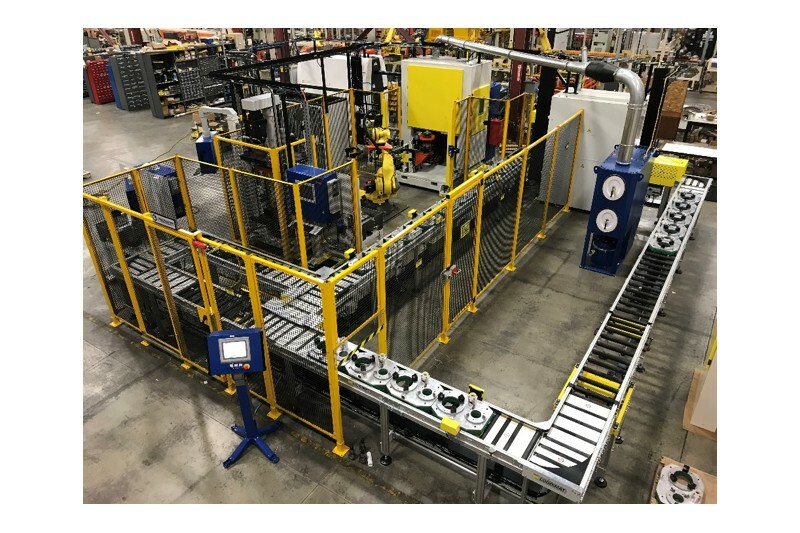 This recent solution includes palletized transfer and of components that are RFID tracked throughout the assembly and welding process. The system assembles and laser welds differential cases and ring gears. The first stop is an ablation station, where the ring gears and differential cases are cleaned with a fiber laser for the laser welding process. Transfer from the palletized conveyor system to the individual operations is taken care of by a material handling robot that transfers the part through a servo-controlled press station and then to the laser welding station. The parts are oriented, clamped under force, and tack welded by the laser. The weld is accomplished using a 6kw CO2 laser with filler wire in the presence of shielding gas. After the laser welding process is completed, the assembly is moved by the robot to an inspection station for a quality check of weld integrity using an ultrasonic system to identify failures such as using an ultrasonic test system to identify failures such as porosity, holes, cracks or fissures along the 360-degree welded area. After inspection, the material handling robot loads the welded assembly back onto the conveyor pallet where good parts are transferred back to the unload station and any rejects to a quarantine zone for later evaluation. The welding lines are inclusive of associated laser equipment including an air-cooled chiller to remove heat from the laser operations, and a fume extractor that is linked to both the ablation and welding stations.